2019 NCR 848. Picture credits - NCR. Submit more pictures. NCR was the official factory team of Dcati North America to compete in the PARTS CANADA SUPERBIKE CHAMPIONSHIP in the THUNDER Class. The team had two NCR 848�s that were developed specifically to develop the full catalog of parts for this exciting new bike. Fuel system: Injection. NCR Corse-EFI, EFI Euro 1, NCR Racing Harness with interface with AMI MXL PISTA display. NCR-EFI system accepts full mapping capabilities along with Lambda interface for closed loop mapping control. Front suspension: Showa original OEM fork with Ohlins-NCR internal damping systems. NCR fork bottoms from billet with 100 mm spacing. Triple clamps made from AL 7075 with adjustable offset from 28 to 36 mm in 1 mm increments. Front brakes: Single disc. WAVE Braking-NCR, radial Brembo Racing monoblock with billet NCR fork bottoms. Rear brakes: Single disc. WAVE Braking-NCR, Brembo Racng 2 piston. Comments: Adjustable rear sets in AL 7075 and titanium, gas cap assembly in AL 7075, clip-ons in AL 7075 with titanium tubes, fork bottoms in billet aluminum, triple clamps from AL 7075 with adjustable offset from 28 to 36 mm, steering damper with billet mount, custom wheel nuts, billet oil fill cover, rear subframe in aluminum, front fairing stay in aluminum. Poggipolini Titanium fasteners. Windscreen. 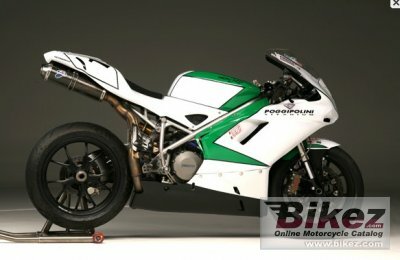 The price price includes a new Ducati 848. Ask questions Join the 19 NCR 848 discussion group or the general NCR discussion group. Enter your e-mail to join the 2019 NCR 848 forum and get notification of answers and new messages about this bike. You can unsubscribe with a single click. Bikez does not display, sell	or misuse e-mail addresses. Bikez.biz has an efficient motorcycle classifieds. Ads are free. Click here to sell a used 2019 NCR 848 or advertise any other MC for sale. You can list all 2019 NCR 848 available and also sign up for e-mail notification when such bikes are advertised in the future. Bikez has a high number of users looking for used bikes. Before you buy this bike, you should view the list of related motorbikes Compare technical specs. Look at photos. And check out the rating of the bike's engine performance, repair costs, etc.